Clearwater Company CMS WorldGroup Helps New Inventors From Concept to Finished Product - CMS World Group, Inc.
June 11, 2016, Clearwater, FL--On the TV show Shark Tank, it seems pretty easy to launch an idea into a business. Contestants waltz in front of the "sharks" with flashy merchandise — be it a toilet night light or edible soap — already made and ready to sell and ship. But the road from concept to finished prototype, even for the lucky ones, is long and full of challenges. Designs and prototypes can go through several iterations. Patents often must be secured, along with legal representation to protect an inventor's idea. 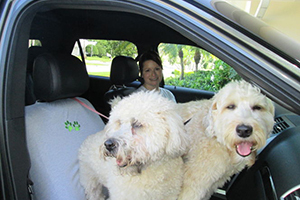 Belleair resident Tiffanie Lopatin, whose two Wheaten terrier dogs had a habit of making messes on her car's passenger seat, had an idea for a waterproof, washable seat cover. But she had a lot to learn about the cut-and-sew industry and packaging and logistics. "Fear plays a factor in all of this — especially loss of the investment," said Lopatin, 45 and a former executive headhunter. "All I knew was that I needed some prototypes made." That was in 2011. Enter CMS WorldGroup, a Clearwater company that manufactures everything from sporting goods to medical device products to footwear from its 17 partner factories in Taiwan, China and Pakistan. If it requires a mold, CMS can do it. Its Clearwater offices have several showrooms with hundreds of samples of the products they manufacture. According to CMS WorldGroup president Charles Ferrer, up to 70 percent of what they make, or have made, is for established, name-brand companies like Everlast, Easton, Rawlings, the National Football League and Major League Baseball. The other 30 percent of their business is helping inventors take their ideas from concept to finished product, including engineering design and port-to-port delivery logistics. According to Ferrer and his staff, they receive calls or emails every day from prospective inventors pitching their newest and quirkiest ideas. Some turn out to be winners, some don't turn out to be the slam dunks the creators think they are. CMS WorldGroup doesn't advertise at all and gets most of its business on referrals, Ferrer said. "The worst kind of customer that we have is the one that tells us, 'This is easy,' " Ferrer said from CMS's offices recently. "Or they just want to sit back, let us do all the work and send them a check once a month." Lopatin wasn't that kind of customer. She admitted she was bullish and knew what she wanted, but she had to fumble through the process on her own. After visiting CMS in 2011 and getting an initial cost estimate, she shopped it around elsewhere and did some of her own tinkering, trying to find the fabrics necessary to make the seat covers. But it became a puzzle — the tags, material liners, boxing, single stitching versus double stitching, instructions, marketing and so on. Lopatin even visited textile factories in Georgia and the Carolinas that turned out to be either vacant or unable to do it for a reasonable cost or in a fixed time frame. She let the idea simmer for quite some time. After spending roughly $10,000 on other piecemeal fabrics and prototypes that clearly weren't going to work out, she came back to CMS. "It is a process of patience, patience, patience," Lopatin said. Ferrer said that when a prospective inventor makes initial contact with its staff and engineers, CMS provides the customer with a nondisclosure agreement, which Ferrer said favors the inventor. He said this is to assure the customer that whatever intellectual property or idea they bring to the table will remain confidential. CMS is not looking to steal the customers' ideas. And Ferrer added that if the customer wants to move on from CMS at any time, they have that option. It creates a no-pressure relationship, he said. Then CMS determines whether the invention could be reasonably successful in the marketplace. If that's possible, CMS sets up a meeting with engineers on staff free of charge to determine the complexities of producing a prototype. At that point a letter of engagement is drafted by CMS for the customer, which will detail costs involved for production of a prototype. 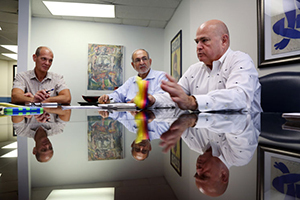 Provided the inventor agrees to the letter, a retainer is determined, Ferrer said, and the inventor then has all rights to the work being produced. Retainer prices vary "depending on the amount and complexity of work to be realized, but we have started projects charging no retainer," Ferrer said, though over the past year, retainers have averaged between $5,000 to $10,000. "At that point, our work on behalf of the client begins," he said, noting that once it gets to a certain stage, his team always recommends their clients retain a patent lawyer. And what about the issue of having the products of American entrepreneurs being made abroad, rather than in the U.S.? "The location of our manufacturing sites has been dictated by international competition and in many cases by our customers, as well, over the years," Ferrer said. "Tiffanie's product is a perfect example. If she were to have her product manufactured in the U.S.A. — she tried for more than two years to do so before coming back to CMS — her cost of production would have been more than twice the current, delivered-to-her-door cost." He said CMS takes responsibility of what is to be produced, including all the raw materials, and manufacturing, saying the company provides a 100 percent guarantee against defects. It also takes care of all the shipping, handling, customs and insurance. 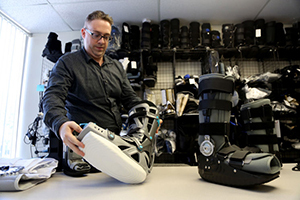 Ferrer added that examples of successful products CMS has helped design and manufacture for inventors include the Lilyjax Brush, sold on HSN, Footglove Performance Footwear, and the Umbrella-Lok. Lopatin said she has paid CMS roughly $10,000, with 30 percent of that being the retainer and the rest being due before shipment of the product order. She was able to see final prototype samples before they were shipped, and she caught a problem in the stitching, which resulted in all 1,000 of her first units being unpackaged, resewn, repackaged and shipped — at no additional charge from CMS. She had rejected four other samples before and said she would not have been afraid to reject a shipment again if it wasn't right. Wayne Rasanen, president of the 33-year-old Tampa Bay Inventors Council, said those who think they have a good idea need to be wary about where they shop it around, especially to invention submission companies who commonly advertise on TV. "There's a whole cottage industry for motives in, 'How do I separate the inventor from his money,' " Rasanen said. "They send you a kit, promise that they get a patent for you — then they want an inventor to spend thousands of dollars on things like provisional patent applications. … But in the end, it comes down to who files a patent first, regardless of who invented a product." Lopatin, who patented her "Seat-Em," also has a patent attorney to protect her invention against other products that may infringe too closely to hers. All told, she has invested about $30,000, but already has a store to begin selling them in Belleair called Fluffy Puppies. She plans to sell them for $39.99 each, and once she has sold 1,000, she'll break even. "People keep asking me, 'Are you going to go on Shark Tank,' " she said. "I watch it religiously, but I don't feel like it's an investable company right now. I need to grow my product first and I'm having fun doing that — it's a happy product." And as for her relationship with CMS? "They've been extremely helpful and knowledgeable about things like packaging and logistics that I simply don't think of," she said. "They want me to succeed because then they succeed. I might be low on the totem pole right now for them, but I know they're looking at the bigger picture — when I'm placing larger orders, which is when I know I'll be doing better, too." Previous PostPrevious CMS Announces Million Dollar Expansion of CMS Pakistan Factory.